In past years, Vladimir Putin has hosted an annual televised call-in for Russian citizens to ask him various questions. For the first time, this year’s conference featured no such citizens, and instead took the form of a four-and-a-half-hour press conference. While the general consensus seems to be that the event was overwhelmingly boring, reactions to some of Putin’s particular statements are worthy of mention. Below are some responses to the press conference by analysts, politicians, and journalists, all gathered from Gazeta.ru and Kasparov.ru. 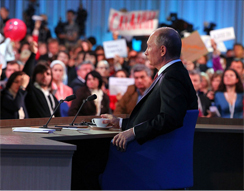 The main thing in Putin’s address was the mass media. The questions did not used to be so incisive, and moreover, if the president responded, then it was a definitive response. He no longer observes these rules. Some of his answers contained counterattacks, and sometimes he said he wasn’t informed of the issue. In regards to the anti-Magnitsky law, he gave the impression that he really wanted to sign it, but at the same time wanted to leave a little leeway to have the possibility of backing off from this law. Not one of his statements was surprising. The goal of this press conference was to retain his supporters. When he answered a question from Gazeta.ru, he was not so much addressing the publication’s readers, but his own supporters, in order to demonstrate that the president is strong. There was no clear message here. The questions were more striking than their answers, just like during Dmitri Medvedev’s television interview. The main issue in the press conference was the rebirth of public political life; the press spoke up, and not just the servile ones like Izvestia. The situation is reminiscent of the end of the ’80s, when the press became the country’s key opposition force. I really liked Putin’s statement about Serdyukov today. It turns out that he isn’t a swindler or a thief, since there hasn’t been a court decision yet. But Magnitsky is a swindler and a thief, and [Hermitage Capital Management head William] Browder is a swindler and a thief, despite the fact that there hasn’t been a court decision. It’s obvious that the war on corruption is a complete fake; they won’t give up their own… I was also struck by [Putin’s statement] that Magnitsky had passed away, and hadn’t been tortured. Although it’s true that after his death they found marks of torture on his body, and his fingers had been crushed. These lies struck me deeply…. Such boredom! Four and a half hours of banality and repetition. Nothing stuck in my memory, everything was predictable. Putin is maintaining the status quo. In regards to the anti-Magnitsky bill – that which he organized, he answered. It is not as if the Duma came up with this bill; it was, of course, the presidential administration. All of this is psychotherapy that has nothing to do with real politics. Putin says: “We do not have authoritarianism.” And just as swiftly: “I could easily change the constitution.” This is some sort of comedy club, not a press conference. The most striking thing to me was the female journalists who asked questions. Katya Vinokurova, Diana Khachaturian, and Masha who said “Thanks, Vova!” all showed with the same conversational manner just how much attitudes toward the acting president have changed in this country. Secondly, it is very important that the issue of yesterday’s law [on banning US adoptions of Russian children] came up seven times, and the people who asked those questions deserve a gracious bow. Thanks to that, the chances of the president vetoing this bill have risen considerably. I was certain that he would act like this during the press conference. He basically said: we’re not going to cave to public opinion. The scariest part is that Putin genuinely thinks that how it is in Russia is how it is everywhere. That is unfortunate. He genuinely does not understand basic things. The most common thing people say to me after my meeting with Vladimir Vladimirovich Putin: “But no, it’s impossible that he didn’t know about you and your book. He’s a security services guy! They would have had to prepare him!” But did he have to prepare for today? To repeat facts and figures, to rehearse answers to totally predictable questions? Enough overestimating this guy. There are already plenty of people who agree that he’s a miscreant. What people still need to understand is that he’s not a very smart miscreant, standing at the head of a behemoth that is utterly casting off the last vestiges of professionalism and the general ability to function. It is a state apparatus built in the image and likeness of its leader: evil and stupid.